On March 2, 2013, Shaheed Akmal Hossain was martyred by brutal attacks to the head by police, and Awami Chhatra League, when he was among protesters who were protesting against the court verdict of Allama Delwar Hossain Sayedee. He passed away at Rangpur Medical College. 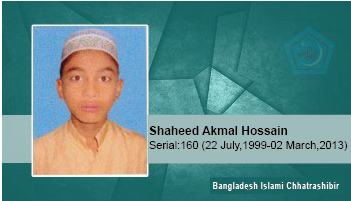 Shaheed Akmal Hossain was a Shibir worker, and a class 10 student in Gyanganj Islamia Dakhil Madrasa.